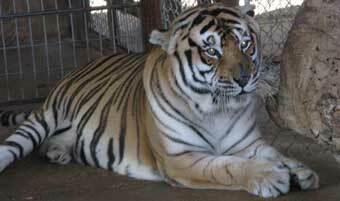 Grumpy was rescued from private owners/breeders who could no longer care for him due to their age and declining health, and came to In-Sync along with 5 other tigers. He was given the name Grumpy by his former owners because of his demeanor. Sadly, Grumpy lived in a deplorable, unsanitary and dangerous environment. 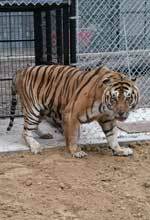 His cage was situated very close to the main road making him and the other cats living at the ranch easy targets for pranksters. When we first visited Grumpy prior to his rescue, he was lying on urine-soaked hay in a broken down wooden den. There were also old chicken quarters mixed in the hay and a wasp nest that was about the size of a football in an upper corner. When he came out of his den he could hardly walk, and we noticed a really long toe nail protruding from his foot pad and a second nail that was thickened, growing out sideways. The day we rescued him, he could not walk at all, so we rushed him to Texas A&M Veterinary Hospital where they trimmed back broken toenails from each one of his front toes. The toenails had curled around twice, split the pad and had been left untreated for so long that his toes healed up around the broken toenail. His toes will remain permanently split. Because he was subjected to pain for so long, he compensated by walking on the side of his feet, and as a result his legs are now deformed, and he lacks muscle tone in his hind legs. When we moved Grumpy to his permanent enclosure he quickly recognized Kazuri and for the first time since coming to In-Sync Grumpy finally chuffed and seems to now be a happy boy. Grumpy is starting to feel more comfortable in his new home. After a few days, he learned what time dinner was served and started waiting at his gate. He will now come when called for treats and is slowly accepting volunteers visiting him. He loves his bones, and we know he’s getting in his tub since he leaves us surprises.